The word broccoli means 'little sprouts' in Italian. It is part of the Cabbage family of vegetables which also includes cauliflower, cabbages, Brussels sprouts, turnips and many of the Asian greens. The variety to the left is Green Comet, one of the most popular varieties of calabrese. Requires frost protection when sown. Broccoli prefers a heavy (not pure clay though) fertile soil in full sun or semi-shade. Other varieties .5kg (1lb) per plant. The words 'broccoli' and 'calabrese' are different varieties of the same vegetable. 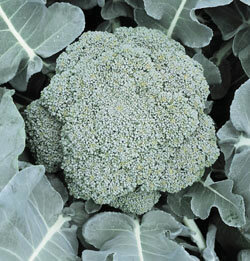 In general terms, Calabrese produces green heads whereas broccoli produces purple or white heads. 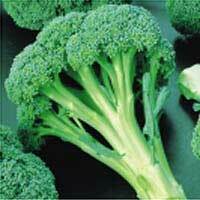 The most common in the UK is 'calabrese' which annoyingly, is sold in some of the super markets as 'broccoli'. The table below lists the broccoli varieties recommended by GardenAction (click on the variety names below for a picture). A firm head, quick-maturing and very reliable. Arcadia F1 is one of the best varieties available. Sow outside in succession from early May onwards and expect to start harvesting two to three months later. A quick maturing F1 hybrid. The green heads are large and tightly formed. Sow in early April giving frost protection for a month and expect to start harvesting two to three months later. Another hardy and prolific cropper producing heads like small cauliflower. Sow the seeds in early May and expect to harvest them early April onwards. First decide if you want to grow broccoli (smaller heads) or calabrese (larger heads). 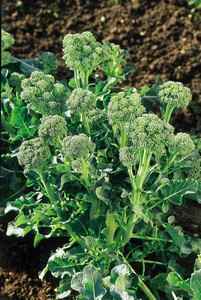 Broccoli matures in spring from sowing made the previous year, whereas calabrese types matures in mid to late summer from sowings made earlier in the same year. Because of the large differences in sowing to harvest times for different types of broccoli, it is extra-important to examine the instructions on the seed packets. That way you won't pick the wrong variety. Message: had a good crop of broccoli[monaco]question if i leave plants in will they reform new heads? I'm growing Italian sprouting broccoli for the first time and I live in New Mexico where the temps are currently reaching over 90 degrees. From what I can tell my plants look healthy, the leaves are hugh but they have not started to flower or produce any broccoli. Is the norm or should I be cutting anything back. The plants have been in the ground for 30+ days. Your help would be appreciated. 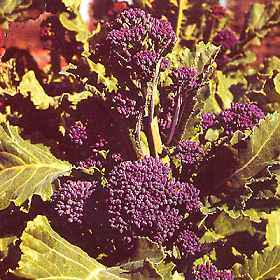 Message: After a good harvest last year, I left the purple sprouting broccoli to keep growing; the woody stalk grew to about 4 feet; the few flowerheads that were left developed massed narrow black seedpods. Two green finches discovered them, and working downwards, stripped the seeds out, leaving the pods still attached; wonderful to watch. I have planned six different plots for them this year. So, if you love bird-watching, dont follow the advice below to prevent broccoli going to seed. how is it that the sowing comes after the harvesting in these descriptions? Are these overwintering from the year before? Can't follow. Please clarify. Another hardy and prolific cropper producing heads like small cauliflower. Sow the seeds in mid May and expect to harvest them early May onwards.